The American Red Cross is continuing to support residents and provide assistance to first responders affected by several fire events around central and south Texas. Red Cross workers opened a resource center and have been providing relief and comfort to individuals impacted by a large apartment fire in San Marcos since Friday morning. The fire occurred at the Iconic Village apartments and the Vintage Pads apartments located just north of the Texas State University campus. Five people were killed in the fire and about 200 people were displaced. Many of the people affected by the fire were students at Texas State. Wills said since Friday they helped 87 people and opened cases for 79 people. Wills said the Red Cross has been working closely with officials from Texas State University, the San Marcos Fire Department and the San Marcos Office of Emergency Management. “We have received very positive feedback from residents, from city officials and from the office of emergency management who are grateful to the Red Cross for the help,” Wills said. Around 100 miles north of San Marcos, the American Red Cross Serving the Heart of Texas has been providing food and supplies to first responders fighting wildfires in northwest Coryell County and the Fort Hood military installation near Killeen. The wildfire fire in Coryell County, which at one point covered around 2,900 rural acres, is still ongoing and was about 75 percent contained as Tuesday (July 24). On Fort Hood, a wildfire fire was burning in four separate locations. Around 6,500 acres on Fort Hood have been affected over the past several days. No lives or buildings have been reported lost from the fire. Penny Peck, one of the Red Cross volunteers working on Fort Hood, said they have been providing three meals a day since Monday, serving about 450 people a day. The Red Cross has also been providing fruits, snacks, water and Gatorade. The soldiers and fire fighters have been very appreciative, Peck said. Gonzales said they have also received positive feedback from county officials, including Robert Harrell, Coryell County Emergency Management Coordinator, and his staff. At another wildfire in Burnet County, the Red Cross of Central Texas has been helping firefighters since early Sunday morning. The fire has affected around 737 acres and was 60 percent contained as of 4:30 p.m. Monday. The fire ignited on a rural county road north of Burnet on Sunday. Concentrated to ranch land, the fire has not prompted any evacuations. Barlow said he and his wife Julie were the volunteers assisting the firefighters and emergency services workers responding to the fire. He estimated they served around 150 clients during the response. After disasters big and small, the American Red Cross focuses on providing safe shelter, food, emergency relief supplies, emotional support, health services and recovery assistance. The Red Cross relies on dedicated volunteers and generous donations to help disaster victims. You can help people affected by disasters like these and countless other crises by volunteering or making a donation to support Red Cross Disaster Relief. Your gift enables the Red Cross to prepare for, respond to and help people recover from disasters big and small. Visit redcross.org, call 1-800-RED CROSS or text the word REDCROSS to 90999 to make a $10 donation. As families across the country prepare to celebrate the matriarchs in their families, the American Red Cross Serving Central Texas is honoring a mother and daughter volunteer team who have made it their family mission to serve their community. Izadora Martinez began volunteering with the Red Cross in 2015 during the floods in Wimberly, TX. Since then, she has become an integral volunteer to the local chapter and organization. Since then, Izadora has served in several disaster relief operations and has become an expert in the many volunteer roles she fills. Her dedication was recognized at this year’s Red Cross Gala as she was awarded the Greg Coleman Tribute Award. Izadora’s passion to serve the Red Cross mission soon became a family affair. After seeing the local chapter’s need for more volunteers, she enlisted the help of her mother Kathy Callahan. After attending numerous Red Cross events with her daughter, the familial and welcoming atmosphere of the chapter peaked Kathy’s interest in volunteering. Soon, Kathy became a fixture at the Austin Red Cross Chapter, often bringing treats and goodies for the staff and fellow volunteers. On Sunday, May 6 the smells of popcorn, gyros and strawberry snow cones joined the sounds of languages from across the globe, laughing kids and shouting teammates at Givens Park in east Austin. Welcome to the third-annual Austin Refugee Day Festival. Since 1975, the U.S. government has welcomed over 3 million refugees for resettlement from all over the world and these refugees have built new lives and homes in all 50 states. Including Texas of course. Austin has about 12,000 refugees, primarily from Bosnia, Burma, Cuba, Sudan and Vietnam. Red Cross staffers Reihaneh Hajibeigi and Ivana Krejci joined volunteer Izadora Martinez to make this a day to remember for refugees and their families. They partnered with eight other organizations including Amaanah Refugee Services, Caritas, Catholic Charities Central Texas, GirlForward, Interfaith Action of Central Texas, Multicultural Refugee Coalition, Austin Soccer Foundation and Cece’s Veggie Noodle Company on the thousands of details that needed to be considered to pull off a successful event. Snacks were supplied by the partners, and the presence of a Gyro truck run by Syrian refugee Ahmed Alzahoori ensured that there would be Halal options for any Muslims at the event. And the entire event was free to the community. Tables from participating organizations described the resources available to Austin refugees and migrants. And attendees could “experience” what it feels like to be a refugee from Latin America – with a simulation that took you from the beginning of the journey in your country of origin, through detention centers, bus stations and finally to hosting families. Want to get involved with the Austin Refugee community? Reach out to reihaneh.hajibeigi2@redcrossorg or ivana.krejci@redcross.org. There are great volunteer opportunities in the community such as be an advocate, teach English/tutor, resume writing and job search, provide transportation and help reconnect families. A few weeks ago on yet another dreary February day, I took a road trip out to Fort Hood to learn more about Red Cross Services to the Armed Forces (SAF). Having never stepped foot on an army base, I had no idea what to expect. The first thing that hits you is the sheer size of the base –38,000 troops that swells to 100,000 people when you count in all their dependents. No wonder it’s the second largest army base in the world. And it’s right here, just an hour outside of Austin in Killeen, Texas. 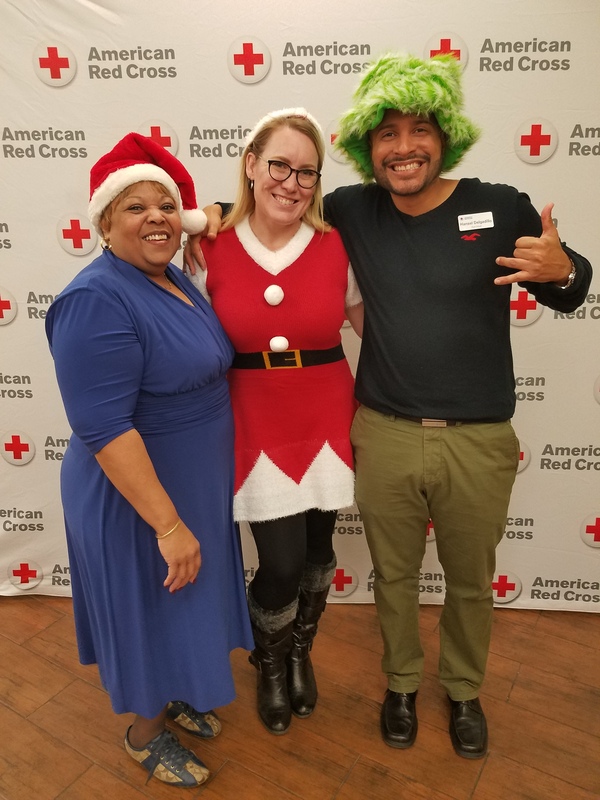 Gigi Winburn (center) with fellow Red Cross staffers Sharron Gilkey (left) and Hansel Delgadillo (right) at the 2017 Fort Hood Red Cross holiday party. Managing approximately 225 active volunteers on post and in the area, Gigi and her team are an integral part of life on the “installation” (you learn a new vocabulary when you visit an army base). This huge group of volunteers also provide thousands of man hours to the Carl R. Darnall Army Hospital. Gigi gave us a tour of the huge installation and we saw first-hand the broad scope of services the Red Cross provides to our military. Sure, I knew about the emergency communication messages and the cards we distribute during holidays, but clearly there’s so much more. Manifest volunteers – Anytime a serviceman or woman deploys, they leave from the same hangar on Ft. Hood. For safety reasons, their families aren’t allowed to be there when they depart … but the Red Cross is. No matter when they leave, day or night, Red Cross SAF volunteers are there with a warm cup of coffee and a friendly conversation. Dental assistant program – Military spouses find it challenging to have a career as they move so often. That can lead to frustration and pressure on the family. So the Red Cross stepped in and put together a dental assistant program right on post. Since its inception in 2009, the program has graduated 79 dental assistants, with 5 more graduating in June. Fisher House – Much like a Ronald McDonald house, the Fisher House Foundation builds comfort homes at military and VA centers around the world where military and veterans’ families can stay free of charge while a loved one is in the hospital. And that takes lots of volunteers—most of which are Red Cross Volunteers at the Fort Hood Fisher House. Books – From book drives to driving book carts, we’re on site at the Carl R. Darnall Army Hospital bringing books and magazines to hospital patients. Patient listening – Sometimes you just need a hand to hold and an ear to listen. Trained Red Cross volunteers step up all year long and meet with military patients and their families at the hospital to offer a listening ear and open heart. If you’re interested in volunteering or learning more about the Service to Armed Forces, reach out to gigi.winburn@redcross.org. For the last 36 years, Yasuko Atkinson has volunteered for the Red Cross in Service to the Armed Forces. She is originally from Japan where she met her husband, Romane Atkinson, when he was serving in the Navy. They married in March of 1953. Yasuko moved to the United States in 1955 to be with her husband and soon after became a citizen. Yasuko opens a container and delicately unfolds a vintage Red Cross uniform. She recalls, “When I put on my uniform it made me happy. Coming from Japan, I felt I had a place to be.” Back then, Red Cross volunteers still wore uniforms, like the nostalgic image of Red Cross nurses in white on the battlefield with their hats. Romane shares that his wife felt a strong sense of duty with the Red Cross, “If she said she was going to be there, she was going to be there.” Romane’s pride in his wife was as strong as her pride for serving the military. Serving the military is in Yasuko’s blood. Her father was an officer in the Japanese Army. She grew up fascinated with the military. She had great aspirations to join the Army like her father. “I was too short to join the military myself. I wanted to be a nurse in the Japanese army, but at the physical examination they said I was too short.” She was 14 years old at the time. “When I saw that big red cross, I felt like I was reliving my dream of being a nurse in the military,” Yasuko recounts. Service runs deep within the Atkinson family. Romane served in the Navy for seven years and in the Army for 20 years. Romane volunteered to join the Navy during the Korean War. He became a Seabee. Later he served three deployments in Vietnam. Their daughter is a retired Lieutenant Colonel and their son served in the Navy for six years as well. They have two grandkids and a new great grand-daughter who undoubtedly will be inspired by the military service that runs deep in their family. Yasuko found volunteer opportunities with the Red Cross wherever her husband was stationed. They spent about three years in Hawaii, five years at Fort Riley, Kansas, and 10 years at Fort Hood. At each installation she worked in the hospital or clinics. She spent time in the physical therapy department, medical library and records, and helped at the front desks across clinics. Yasuko treasures her various Red Cross awards, pins and mementos. In her 36 years, Yasuko’s dedication garnered countless awards and even recognition from two Texas governors (Bill Clements and Ann Richards). Her collection of pins adds up her years of service: five years, 10, 15, 20, 25, 30, and finally the 35-year pin. She displays them in a decorative shadow box along with her Clara Barton’s 150th birthday coin she received while at Fort Riley in Kansas. “When I volunteer something good happens to me,” Yasuko beams a proud smile.